Today more than ever, people are concerned about the environment and how to make it a better place for future generations. We’re careful to sort and recycle our trash, keeping excess waste out of landfills. But did you know we could be utilizing this same ideas for our home decorating? From decorating with vintage furniture to turning old items into something new, there are plenty of ways to apply “green” decorating techniques within our home. By keeping that popular environmental mantra in our heads – “reduce, reuse, recycle” – we can make our homes a comfortable and inviting space with eco-friendly products. Purchase pre-owned or vintage furniture. We’ve already talked a lot about the perks of decorating with vintage furniture. With a little creativity, it’s easy to incorporate vintage pieces into your modern décor. 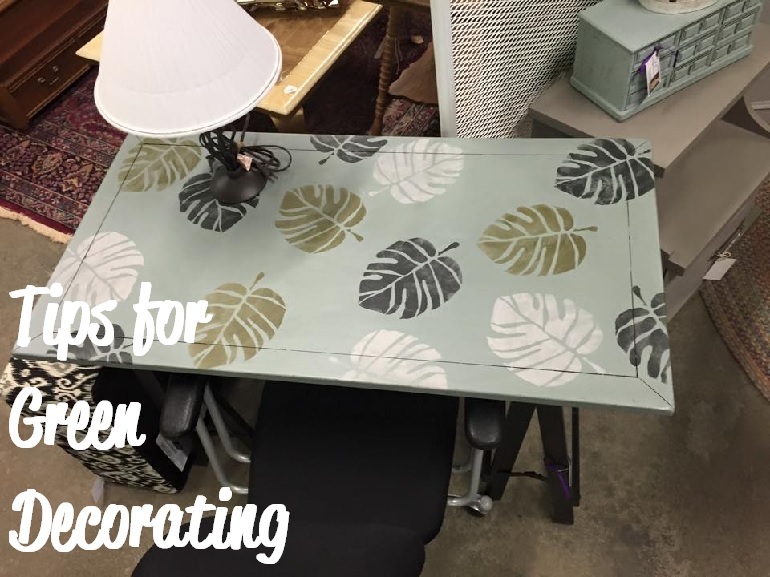 You can even repurpose or refinish pre-owned furniture to make it truly unique or match your current color scheme. Purchasing pre-owned furniture is friendly to the environment because you’re saving these large items from taking up space in landfills. Use items directly from nature. Instead of purchasing expensive decorations, make some of your own. 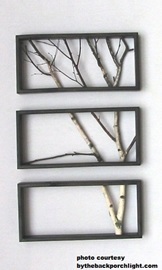 For example, take branches from outside and frame them to create a lovely indoor “tree”. You can also choose to decorate with natural fibers like bamboo, cotton or linen. Use eco-friendly products. When painting a room or refinishing furniture, look for paint that is labeled “low-VOC” or “zero-VOC”. VOC stands for volatile organic compounds, which are emitted into the atmosphere as gases. Low-VOC paints have much lower harmful emissions because they use water instead of petroleum-based solvents. Creatively reuse items. Every-day items can be reused in fun ways throughout your home. Save corks from your wine bottles to make a corkboard for your kitchen or a wreath for your front door. Bottles and jars can be cleaned and reused as vases or storage for other items. Donate items you no longer use. Instead of simply throwing quality items you aren’t using into the trash, consider donating them to charity or a women’s shelter. Just because you don’t like it or don’t need it anymore doesn’t mean someone else won’t get use out of it- especially someone in need. Environmentally-friendly home decorating doesn’t have to be expensive or time-consuming. Filling your home with items that are renewable and sustainable will help keep your carbon footprint smaller, and will also create a unique space that makes you feel good about your choices. If you’re looking for some ways to decorate your home while being eco-conscious, stop by our resale shop! You’ll find an amazing array of preowned and vintage items to make your home a relaxing, comfortable space while saving some of the green in your wallet, too!